Murderers. Seeing this, who wouldn’t pick up a rifle to end fascism’s destruction. Children killed by rebel bombs in Madrid, innocent victims of the horrible war unleashed by the enemies of Spain. Murderers. Seeing this, who wouldn't pick up a rifle to end fascism's destruction. 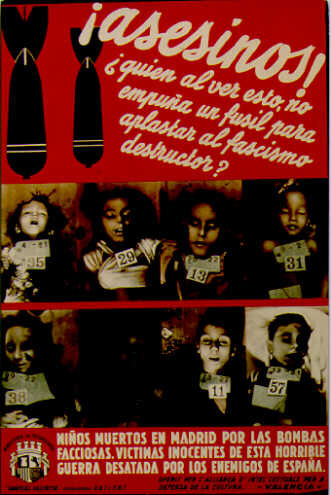 Children killed by rebel bombs in Madrid, innocent victims of the horrible war unleashed by the enemies of Spain.